Hi everyone! Welcome to Block 21 of our Glorious Autumn Block Party. Today we have Melissa Corry as our featured designer and ChristaQuilts invites you to shop their Bargain Bin for fabrics under $6 per yard. Plus don’t miss Melissa’s designer give-away too. ChristaQuilts specializes in carrying hundreds of fat quarter singles and bundles, Moda Precuts, and exclusive quilt kits. We also carry designer fabrics from Amy Butler, Kaffe Fassett, Paula Nadelstern, Dr. Seuss and many more. We offer free US shipping and flat $10 international shipping with NO minimum purchase! 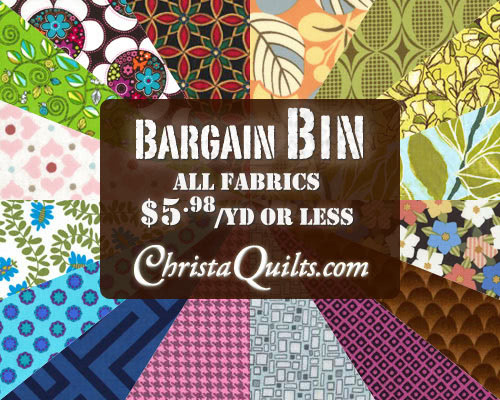 Shop Christa’s Bargain Bin – scores of designer fabrics under $6 per yard! This deal is open to everyone near and far and is good while fabrics last. Shop early for best selection! No coupon needed. These are premium quality fabrics at deep discount prices. Before I moved away from home with my husband for the first time I asked my mother to teach me to quilt. I figured I was about to have some lonely evenings on my hand and needed some hobbies. I began slowly. My mother got me started on this Christmas Around the Year quilt and I worked on it for some time and eventually gifted it to my Mother In Law. I found I also enjoyed being able to create adorable baby blankets for friends. 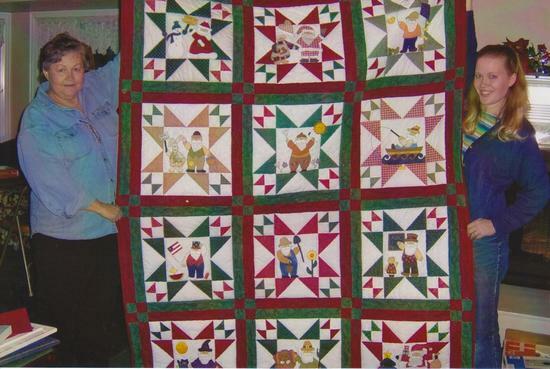 I created Happy Quilting in July of 2010 after my husband got on my case for hijacking our family blog. I can’t believe how quickly it has grown!!! Honestly, I don’t know how the transition happened. It was very gradual. I started by designing a few quilts for tutorials, then that led to the next, and then that to the next, and before I knew it I was designing patterns. And I am so grateful that my blog and this amazing online quilting community has afforded me these amazing opportunities. Picking a favourite quilt is like choosing a favourite child. I normally find that the latest one I put together is my favourite. 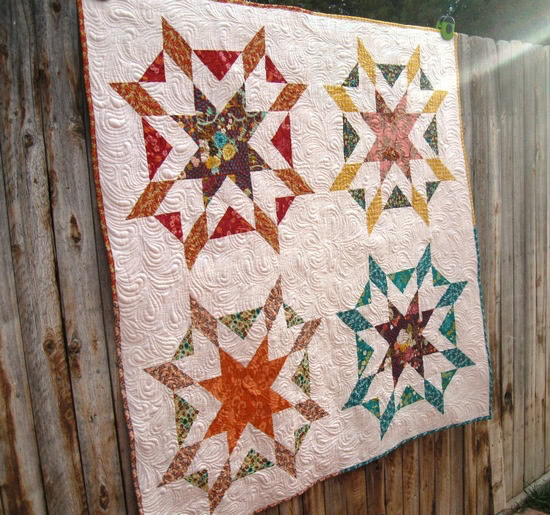 So with that in mind, my favourite would be my Starburst quilt that I designed and wrote a tutorial up for. How many UFOs do you currently have? I have actually been trying to really work on these and I think I am down to 5 now. What size of quilt do you prefer to make/design? I love baby quilts but lately have been making a lot of bed quilts. I figured it was about time to start making some quilts for my kids beds. What colour do you use most often in your quilts? Most likely white. I am a huge fan of a crisp white background. Favourite one-sentence tip for a new quilter: Have fun and do what makes you happy. 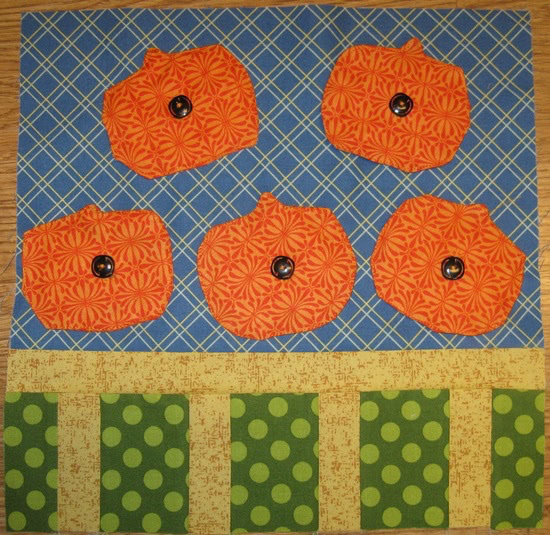 Here’s Melissa’s super cute block, 5 Little Pumpkins, inspired by a story and song of the same name. She’s included instructions for making the pumpkins detachable, so that you can sing-along with your littles ones if you wish. Head over to Melissa’s blog to view the tutorial. See the previous 20 free blocks here! 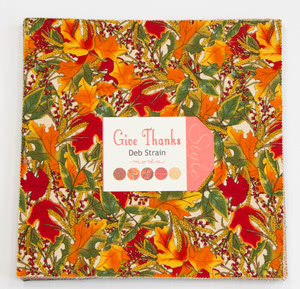 Ready for fall, how about a Give Thanks Layer Cake to aid in your fall projects! 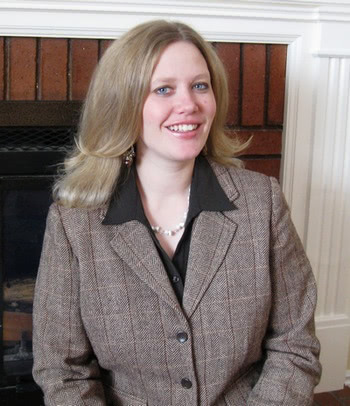 See Melissa’s blog for the give-away details.